The Genes and Dynamics of Memory Systems team studies the mechanisms of olfactory learning and memory using an integrated approach in Drosophila. Aversive long-term memory (LTM) forms after repeated presentation of and odorant with electric shocks. They showed that the vertical lobes of the mushroom body, the olfactory memory center, processes LTM . Recently, we identified 2 pairs of dopaminergic neurons projecting to the mushroom body that control LTM formation (in red on A). In normal condition (B), these dopaminergic neurons show strong oscillating activity when LTM is formed. (C) In starved flies, oscillations are abolished and LTM formation is inhibited. 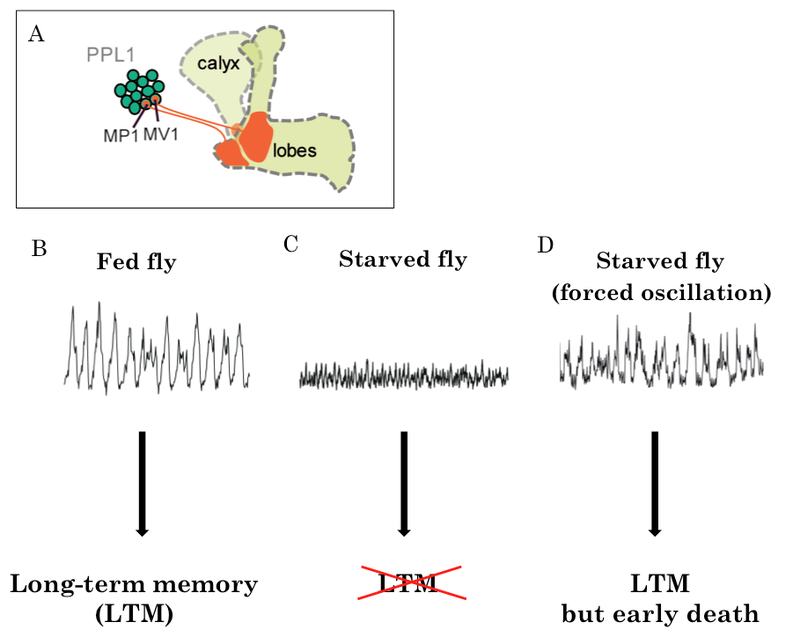 (D) If the oscillations are forced in starved flies using artificial stimulation, LTM can form in starved flies. But flies die faster than their naive siblings. Thus, under reduced resources, the brain regulates its activity and energy metabolism to promote survival. Thomas Préat’s “Genes and Dynamics Memory of Systems” team studies the mechanisms of olfactory aversive and appetitive learning and memory. They develop in fruit flies (drosophila) an integrated approach ranging from molecular studies to behavioral analyses, through the functional study of networks. The activity of biochemical pathways of interest is studied in vivo with genetically-encoded fluorescent probes. They use drosophila as a model system to study aspects of the pathophysiology of Alzheimer’s disease. How are memories encoded in the brain? How do the different forms of memory interact? The major challenge faced by neuroscientists studying memory is to define the links between the various levels of brain organization, starting with molecules and cells, then neuronal circuits, and finally the global cognitive functions. The drosophila brain is a fascinating biological object: although it contains a small number of neurons (about 100,000), it is highly structured and controls sophisticated behaviors. Furthermore, the drosophila brain uses the same building blocks as the mammals one (neurotransmitters, signal transduction cascades, transcription factors), and most of the molecular mechanisms underlying memory processes are conserved throughout evolution. The strength of the molecular genetics tools available in Drosophila, along with the properties of its highly organized brain, make it a model of choice for such an integrated approach. A bilateral structure made of about 2.000 neurons, the mushroom body, plays a central in olfactory learning and memory. 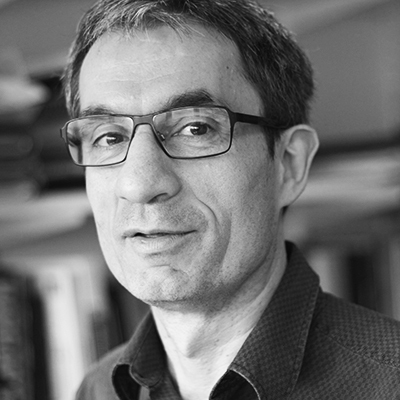 Thomas Préat’s laboratory is engaged in top-down and bottom-up approaches to unravel some of the general mechanisms involved in associative learning and memory. To study the mechanisms of aversive memory Thomas Préat and his team use conditioning protocols during which Drosophila learn to associate an odor with electric shocks. Intensive conditioning with a rest interval between the stimulus presentations (spaced conditioning) leads to the formation of long-term memory (LTM). Following a continuous stimulus presentation (massed conditioning), a different form of consolidated memory is generated in Drosophila, called anesthesia-resistant memory (ARM). They also study appetitive memory, which forms in starved flies after odorant and sugar presentation. The genetic tools developed in drosophila allow them to vary at will the expression of genes of interest in the memory centers of the adult, and to manipulate the activity of specific neuronal networks during aversive or appetitive learning, consolidation or memory retrieval. Within neuronal networks, the activity of biochemical pathways of interest is studied using genetically-encoded fluorescent probes, whose activity is monitored in vivo by confocal or two-photon microscopy. In parallel to their study of olfactory memory mechanisms, Thomas Préat and his team use Drosophila to study some aspects of Alzheimer’s Disease (AD), a progressive neurodegenerative pathology that first manifests as a memory decline. While the main hypothesis for AD pathology centers on the proteolytic processing of amyloid precursor protein (APP), little is known about the physiological function of this protein and it’s derivatives in the adult brain. They study the role of the Drosophila ortholog AAPL, and they showed that APPL-loss of function in the adult mushroom body affects specifically LTM formation. These data support the hypothesis that disruption of normal APP function may contribute to early AD cognitive impairment. They currently analyze in more details the physiological implication of APPL protein in memory processing, and study the interaction of this pathway with amyloïd peptides. Upregulated energy metabolism in the Drosophila mushroom body is the trigger for long-term memory. Two independent mushroom body output circuits retrieve the six discrete components of Drosophila aversive memory.